President Donald Trump tweeted on Saturday that he is open to a third summit with North Korean leader Kim Jong Un, citing their "excellent" personal relationship and understanding of "where we each stand." "I agree with Kim Jong Un of North Korea that our personal relationship remains very good, perhaps the term excellent would be even more accurate, and that a third Summit would be good in that we fully understand where we each stand," Trump tweeted before heading to Trump National Golf Club in Sterling, Virginia, for the day. "North Korea has tremendous potential for... extraordinary growth, economic success and riches under the leadership of Chairman Kim," Trump added. "I look forward to the day, which could be soon, when Nuclear Weapons and Sanctions can be removed, and then watching North Korea become one of the most successful nations of the World!" In a speech reported by North Korea's state-run media, the Korean Central News Agency, Kim announced that he is willing to meet with Trump for a third summit and praised the personal relationship he has developed with Trump. 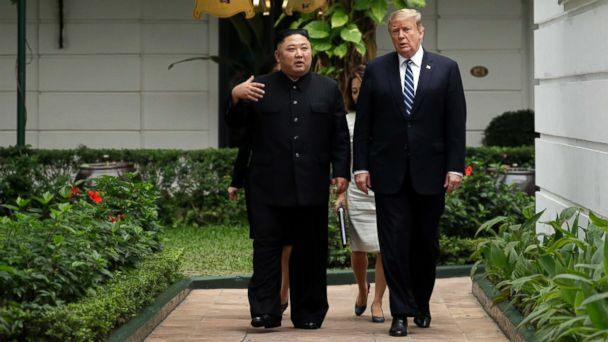 "As President Trump keeps saying, the personal ties between me and him are not hostile like the relations between the two countries and we still maintain good relations, as to be able to exchange letters asking about health anytime if we want," Kim said. "We will wait for a bold decision from the U.S. with patience till the end of this year but I think it will definitely be difficult to get such a good opportunity as the previous summit," Kim said. "There are various smaller deals that could happen," Trump said "You could work out step-by-step pieces, but at this moment we're talking about the big deal. The big deal is we have to get rid of nuclear weapons."